Light is necessary for vision – but too much light can leave us experiencing problems with our vision. Anti glare window tint is an easy and effective solution to blocking out unnecessary light that causes discomfort. Anti glare window tint is a cost-effective solution to filtering out unwanted light that causes glare, whilst allowing the natural light to fill the room. What Causes Glare, And How is it Harmful? Excessive and uncontrolled brightness from light, either natural or unnatural, can create a potentially uncomfortable and disabling visual experience. The older you get, the more sensitive your eyes becomes to the potential glare from light. In this instance, disability glare is the reduction of visibility due to the intensity of light in the form of a glare. With disability glare, light scatters across your eye and reduces the ability to see sharp images. Discomfort glare, while creating a different sensation, also hampers vision by creating an annoyance (and even pain) from the effects of light. Glare can make you squint, make your eyes well up, and lead to migraines. The good news is that glare can be reduced in your residential setting by adding anti glare film. Your home can become comfortable again, despite the glare. How Does Anti Glare Window Tint Help? Most importantly, anti glare film reduces the discomfort and the disability of glare from the sun. Working to reduce headaches, squinting, and blurriness when reading, looking at screens, or simply trying to have a conversation. There are several glare-blocking options available on the market, such as drapes and shades, and anti glare tint is one of the most economical options. This option can also be more economical in the long run by cutting costs on utility bills through the reduction of heat. While drapes and shades block out all light entering the room, anti glare film only blocks the glare from entering the room but still allows light to enter, meaning that your room remains brightly lit. In addition, the view from the window is maintained, unlike drapes and shades. An overlooked disadvantage of having unprotected windows is the intrusion of harmful UV rays. This radiation can damage your skin and eyes over time. 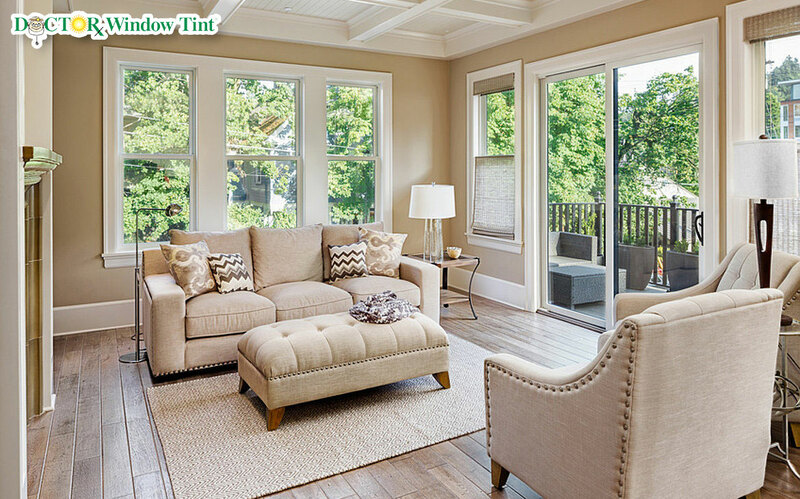 Window tint, which can block up to 99% of UV rays can also protect your belongings such as furniture, fabric etc. With the options of a variety of colors and levels of opacity, you can choose the perfect appearance and performance that you want for your home. Anti glare window tint proves its value in an economical, aesthetic, and practical sense. If you are struggling with glare, but do not want a dark room with a limited view, then don’t delay in getting your window tint applied today. Give Doctor Window Tint a call.